Easter is also known as Easter Sunday or Pascha or Resurrection Sunday. This is a festival that commemorates the resurrection of Jesus Christ from the dead as narrated in the New Testament. This event occurred on the 3rd day after his burial post his crucifixion. In all those countries where Christians form a significant part of the demography, Easter is declared a public holiday. Netherlands, USA, Canada, UK, Australia, etc. are the major countries where Easter is celebrated in a big way. People celebrate this day by visiting the church and later on feasting with close friends and relatives. Everyone in the family takes an active part in this Easter celebration. Kids are the engines of the home and they are always bursting with energy. So, quite obviously they have the most fun during the Easter celebration. 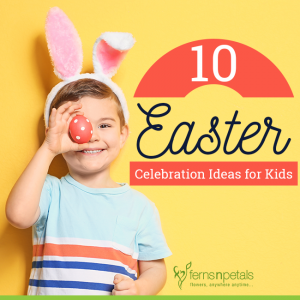 So, this blog will further discuss some fun Easter celebration ideas that your kids would simply love. Some of these ideas can be used as gifts for kids! The egg is an ancient symbol of new life and it has been associated with pagan festivals celebrating spring. From a Christian perspective, Easter eggs are said to represent Jesus’ emergence from the tomb and resurrection. Therefore, Easter eggs are used as gifts as well as in decoration of home. 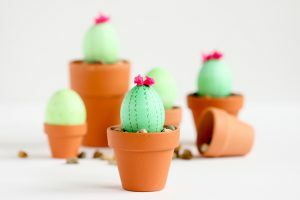 To make a cactus egg, you will need – a pot, eggs (artificial ones), pebbles, green egg dye, black marker, paper flower (optional). Take the egg and color it with green egg dye and let it dry for a while. In the next step, draw the thorns (simple sign of “multiply”) all over the egg and allow it to dry again. Now take the pot and fill with pebbles and place the egg. Glue the paper flower atop the egg. It will look like a moon cactus. 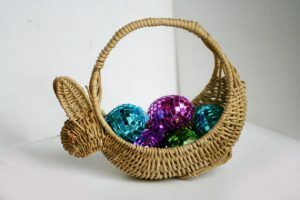 Buy a bunny-shaped wicker storage basket and fill that up with straws, chocolates wrapped in colorful papers, soft-toys in bunny shape, and of course, Easter eggs. Your kids and their friends would find this basket really cool and funny. So, don’t forget to use these gift-filled baskets as your Easter giveaways. There will be people at home and there will be your kid’s friends too. Therefore, to add much fun to this celebration, you can arrange for a competition. 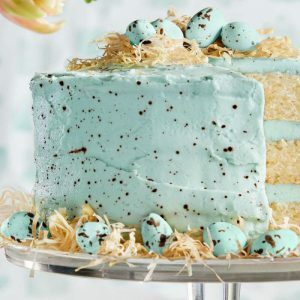 Select a certain recipe of Easter cake and divide the kids into different groups. Now each group would be given the recipe and ingredients and they have to make an Easter cake. The one who comes up with the most beautiful looking cake would be awarded something special (that you can decide). Call your kids and ask them to help you in the kitchen too. To bring the kids to the kitchen sounds boring but if you have something interesting, innovative, and colorful – the kids will be interested. There is great joy in cooking together and then relishing on the food later together. Your kids will learn “team-work” through this task. To make these colorful cake balls, you will require baked vanilla cake (either order online, or get it from a local bakery, or prepare yourself), white and dark chocolates, sugar, cream, and vanilla essence. You have to break the cake into small crumbs and mix sugar, cream, and vanilla very well until smooth. After mixing them, let the mixture cool in the refrigerator for an hour. Meanwhile, melt the white and dark chocolates and keep in separate bowls. Now, take the cake mixture out from the refrigerator and prepare small balls, dip into white chocolate, and then roll over the plate of colorful sprinklers. Follow the same process with dark chocolates too. And then refrigerate these cake balls again. 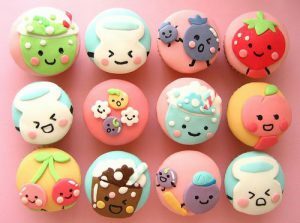 As a gift for kids, these cake balls would be amazing! Gather the kids and let them enjoy a lovely and fun game. 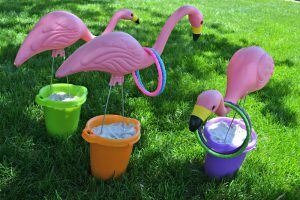 You need plastic flamingos with stakes (4-5), sand, colorful pots, and some rings. Now pour some sand into the colorful pots and place the flamingos. 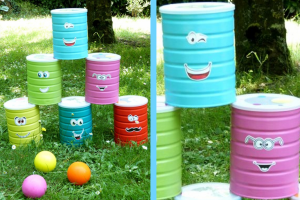 Place these cute pots in a corner of your home or garden and from a distance, ask the kids to throw the rings. The rings need to drop right around the neck of the flamingos. The one who gets most of the target would be the winner. Be it the kids or the adults – who doesn’t like to play tic-tac-toe? So, this Easter enhances the fun by making your own tic-tac-toe set. 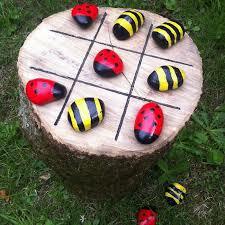 You will require some riverside rocks (in flat shape), black marker pen, paint of your choice, and a circular wooden log. Now, wash and dry these riverside rocks first. Now, paint them with your favorite colors to make bunnies & Easter eggs. Draw the lines on the wooden log and start playing the game. For this game, you will require the unused tins at your home, paint, markers, ball, and some decorative things like laces or colorful stones (optional). Take at least 10-15 tin cans and first wash them nicely and then dry. Now, apply colors of your choice and allow them to dry. Write something related to Easter on these tin cans or write names of your kids. Glue the decorative items on them in case you are using them and just get started. Your kids must be getting ready with their Easter dress code. So, enhance the fun and spirit by gifting them cute bunny pendants. Let them find that in their Easter basket. 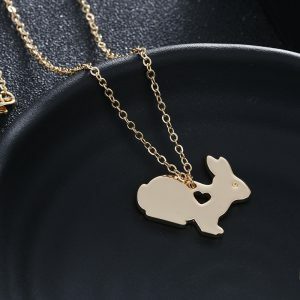 You can either get these bunny-shaped pendants online or get them made from a local jewelry store. Engrave the name of your kid or the initial of his/her name on this bunny. Take a necklace and hang this pendant for the kids to wear. 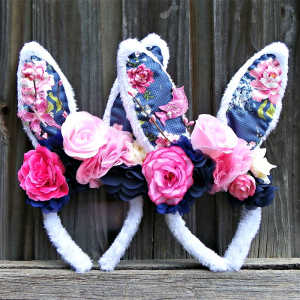 How can your Easter celebration be complete without these super-cute bunny ears headbands? This is the coolest thing that will enhance the festive spirit among your kids. Bring a variety of bunny-shaped headbands – the simple printed ones, the colorful ones, and the glittery ones with embellishments on them. Let your kids choose their favorite ones! Surprise your kids on the Easter morning by serving them Easter-special breakfast. 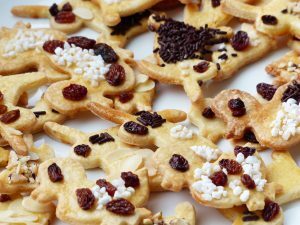 The bunny shaped bowl, bunny-shaped cookies, or a bunny (made with jam) on a toast – all these can be implemented. If you can arrange a bunny-shaped mold, then, you can make muffins and omelets too.